Panel Shows Are the U.K. Rage But Here's Why They'd Never Work in the U.S.
I&apos;ve fallen down a rabbit hole of British comedy panel shows, but no one else seems to have fallen with me.
" ... British panel shows?" my roommate asked with the same glazed expression every other American I&apos;ve attempted to bring this topic up with has adopted. "No, sorry. Bored." While British TV dramas like Game of Thrones, Downton Abbey, and Dr. Who have all easily found their place with American audiences, comedy shows like The Office and The IT Crowd have felt the need to "Americanize" their humor, and the British comedy panel format seems to defy translation completely. OK. So maybe "panel show” does sound a bit like a dry, serious discussion conducted in some stuffy auditorium. Except in this case the panel is made up of British comedians and celebrities! 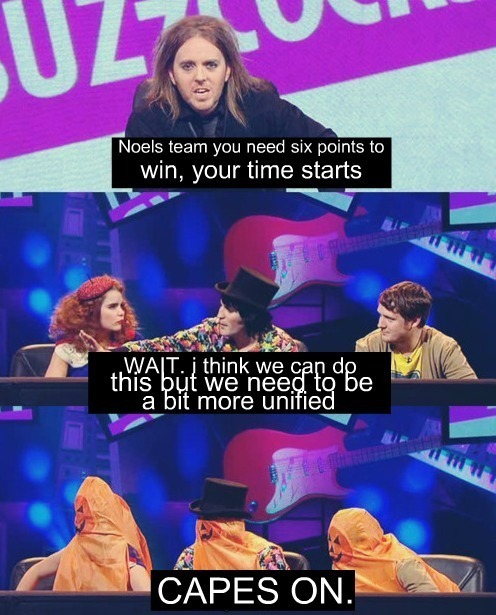 Like a trivia game show, British panel shows tend to follow a quiz format, except, unlike a trivia game show, there are no prizes — the contestants instead preferring to wander around the topic given, offering improvisational comedy, witty banter and nonsensical ramblings. The format can be applied to just about any theme. 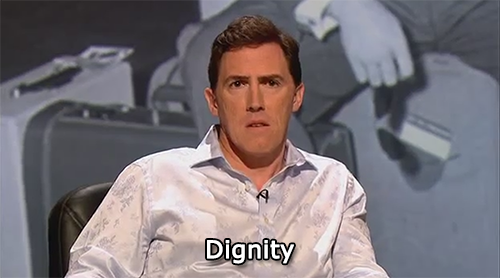 Never Mind the Buzzcocks, for example, is music-based panel quiz, while Mock the Week, with its topical questions and improv challenges is a bit like Whose Line Is It Anyway meets The Daily Show. 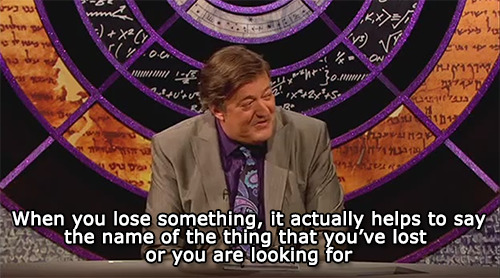 QI, my first introduction to the format and personal favorite, is hosted by British personality Stephen Fry. Questions are based on general ignorance and contestants are awarded points for being interesting, rather than for offering obvious or boring answers to questions. The topics covered range from ancient phrenology to the minimum IQ required to join the Spanish army, and the banter is fast and ruthless. "Yes, well. There&apos;s a Socratic acceptance of the limitations of one&apos;s own knowledge, and then there&apos;s ignorance, that&apos;s all I&apos;m saying," Fry mutters, adjusting his cue cards after sparring with a contestant. QI, despite its high intelligence, has enjoyed outstanding popularity in Britain and is in no way "niche." But even in its tenth year of production, QI still hasn’t been able to find a US market — Comedy Central, PBS, Discovery, and even BBC America have all turned it down. While BBC America president Garth Ancier has stated his belief that Americans just "won&apos;t get it," the executive producer of QI, John Lloyd, disagrees — looking to show’s internet popularity as well as the show’s first book, The Book of General Ignorance, making New York Times&apos; Best Seller List its first week. So does the BBC think Americans are too stupid to get the fast-paced banter? Should we be offended? In fairness, some attempts have been made to bring the panel game format over. In 2011, British comedian Graham Norton introduced Would You Rather? to BBC America. I haven’t seen much of the show, but in the one promotional clip I saw on the website, the audience seems as unsure as the panel as to how to react to the format. “For the next year, would you rather be dressed as a mime every day, or look normal and not be allowed to talk?” Norton asks to a trickle of laughter. “Do we ring?” Michael Ian Black asks, gesturing to the buzzer in front of him. “Not yet,” Norton replies. “Don’t put a bell there and then have us not ring!” Black complains, as Norton cries, "We&apos;ll get to the bells!" From there, the panelists gave their answers to the question one by one, each listing mildly comical reasons for their choice, and then engaging in a quick debate. Maybe it just comes down to cultural differences. One of the best descriptions I&apos;ve heard of the difference between American and British humor is given by Stephen Fry: "Do you know that scene in Animal House where there&apos;s a fellow playing folk music on a guitar and John Belushi picks up the guitar and destroys it and waggles his eyebrows at the camera? Well, a British comedian would want to play the folk singer." The great British comic heroes are people who want life to be better, Fry argues, "and on whom life craps from a considerable height." American jokes, like Americans themselves, tend to be more obvious and forward. American stand-up comedy is generally more slapstick, sensational, and competitive, whereas there&apos;s something about the self-deprecating, dry wit of British humor which lends itself much more readily to witty banter. Perhaps most importantly, while American shows either tend to be highly produced or fall into the style of a debate, what makes the British panel shows so successful is their unique brand of amiable and wandering conversation. Perhaps drawing from a tradition of Victorian parlour games and sketch comedies like Monty Python less familiar in the United States, the British shows also feature spontaneous, fierce comradery and occasional moments of near-surrealism which tend to get lost in their Americanized versions. So could the panel format ever take off here? I think it could. NPR’s radio comedy news show Wait Wait ... Don’t Tell Me approaches the panel format, and there has been proven love for both improv shows like Whose Line is it Anyway topical, satirical shows like The Colbert Report or The Daily Show. Maybe if we could just get started with something like Mock the Week — part panel show, and part improv — we might be able to eventually get there. 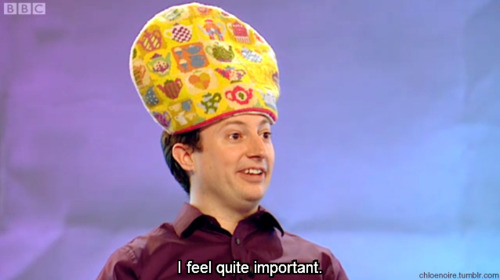 In the meantime, however, I&apos;ll be happily watching my QI reruns YouTube.